Seattle Public Schools sat down with KING 5 to explain how Washington schools are funded, and why the largest school district in the state is facing a $45 million deficit next year. If you have questions about where our schools get their funding and where it all goes, you are not alone. This week, State Superintendent of Public Instruction Chris Reykdal proposed a new capital gains tax to help pay for educating our kids. It triggered immediate questions from KING 5 viewers asking about all the talk of increased state funding from McCleary, property taxes, and levies. As the dust settled from the legislature's McCleary compromise, some smaller districts with less local revenue got more money, while the larger districts, like Seattle, ended up with less. Seattle Public Schools Deputy Superintendent Stephen Nielsen showed KING 5 where the district's money comes from. "Basically, schools are funded with three funding sources," said Nielsen. "Every school district in the state of Washington has state dollars based on your enrollment and the types of students you have." "Federal dollars ... they're grants that come from the government to support at-risk students and other needs, special education, etc. And local dollars from levies," said Nielsen. Under the compromise state lawmakers made known as "The McCleary Deal," a new funding formula boosted state funding but lowered local taxes. Nielsen explained what it meant for Seattle. 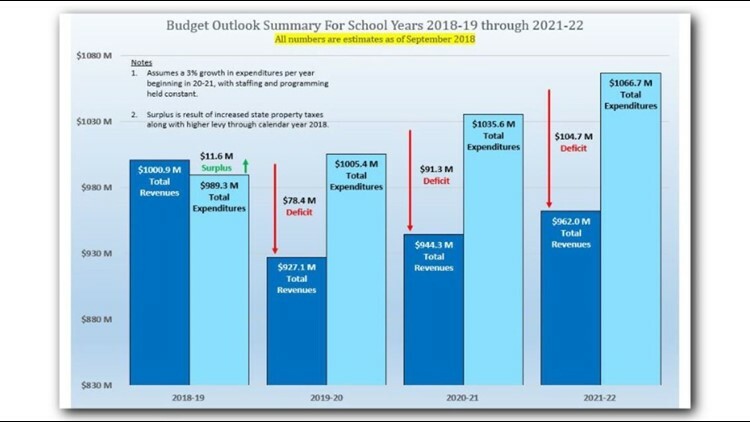 "In [the 2018-19 school year] we're projecting we'll have $646 million from the state. Next year we're projecting, because our enrollment has dropped a little bit, remember when we said it's driven by the school enrollment, we'll get $643 million," he said. But while state funding basically stays the same for Seattle, the local levy money goes way down. "This year we get $178 million and next year we get $135 million," said Nielsen. "That's a loss to the Seattle School District of about $45 million." 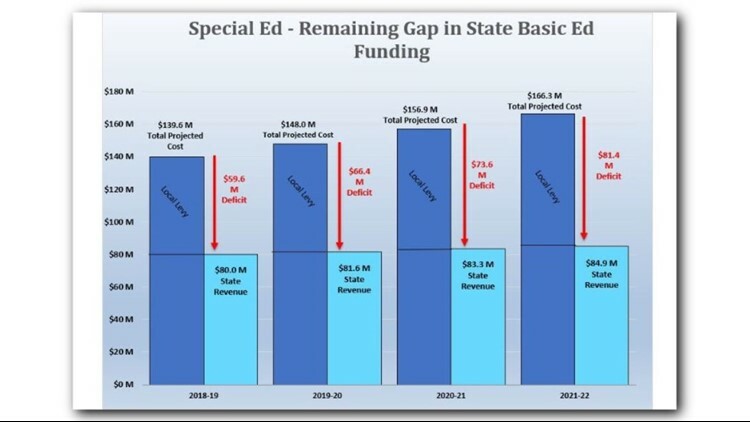 That virtually erases a chunk of funding for things the levy pays for, like special education, the English Language Learner Program, and extra staffing like nurses and counselors. "With a loss of $45 million and no added state money, what are we going to do to cover these and other levy costs?" Nielsen asked. As the district grapples with the short-term deficit, voters will need to get ready to make long-term decisions. Over the next four months, Seattle voters will be asked to approve three levies: Proposition 1, the mayor's education levy, along with two school-sponsored levies – one for capital construction and the other for operations. The district described its two levies as the foundation for education. The mayor's levy would pay for the extra needed support, like preschool, summer school, and community college. Nielsen said that voters have not voted down an education levy in Seattle since the 1970's, but admits the district is concerned about levy fatigue.